Set of 6 fluorescent green acrylic templates and basic instructions to make the T Block in 3 sizes 6 inches, 8 inches, and 10 inches. Use with your rotary cutter. While supply lasts! This one-block quilt was designed to be used with the Amazing T Template Set. Included in this pattern are full-size templates, rotary cutting instructions, and step-by-step piecing directions to make a queen size quilt. Finished size 100" x 100". 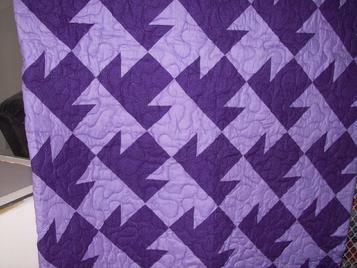 This one-block quilt was designed to be used with the Amazing T Template Set. Included in this pattern are full-size paper templates in 3 sizes, cutting instructions, and step-by-step piecing directions. Finished size using the 6 inch block measures 50" x 62". A quick, fun quilt using the traditional Mill Wheel Block. This quilt was designed using the 6 inch B template from the Amazing T Template Set. Included in this pattern are full-size paper template, cutting instructions, and step-by-step instructions. Finished size shown is crib size (46 x 55 inches). Instructions are also included for twin size (64 x 82 inches) and queen size (100 x 100 inches).